I am visiting Houston in a couple of weeks. … I was wondering: are there any particular routes that would be interesting to ride as an example? But I don’t know how I would direct a tourist to experience this — the way it’s so easy to tour a piece of transit technology. You can ride one of the redesigned bus routes, but you won’t notice it’s redesigned unless you try to travel through the system for many purposes. You can ride a cool bus, and take pictures of it, but then you’ve toured another piece of technology, not the network. You’d have to live in the city, and use the bus to go lots of places, in order to experience the thing that we designed, which is the sheer ease of getting to many places more quickly. At best, you could tour information and wayfinding systems. If you stand at a bus stop, how obvious is the network and its usefulness? This is a kind of tourism that I encourage, and that I always engage in. But the wayfinding is not the network. Many transit networks are much better than you’d guess from their public information, signage, etc. Here is yet another example of why cities often look at improving their bus networks only after they’ve tried everything else. There’s nothing to tour, nothing a visitor can see in an hour that would give them a sense of it. I’m curious if anyone else has encountered ways to make bus network redesign an object of tourism. Because among urbanist opinion leaders, tourism is a huge part of how ideas are transmitted, and valued. 25 Responses to Can You Tour a Bus Network Redesign? Write down 5 interesting destinations on different lines where you might meet someone. Pick one at random. How convenient is the best immediate trip there? Could you swing by one of the other destinations without making the trip take more than 30 min extra? Start heading that way. After 15-20 minutes randomly pick a different destination. How easy is it to change plans? At a transfer, find a bathroom, a snack and a place to sit out of the weather. How convenient are those things? Was paying for your snack easier than paying transit fare? Along the way, ask strangers for directions to see how they know/use the system and strike up a conversation. Ask how long their trip used to take or any other differences. Enjoy your ride! I was going to reply something like this, but you (Eric Goodman) already did! If the product is freedom, then the tourist would need to experience how free the system lets them be. Best way to do this is to just set off in the system with various places they may want to go, and change their minds and move around the city without a pre-researched plan. The quality of that experience best reflects what the system design is trying to do. Of course, it won’t be the same as a resident’s experience, and I would not expect it to. Even motorists going to a new city have to adjust to new roads and get lost sometimes, or go by an inconvenient route. That’s a normal part of a new environment. You got it. The premise I was operating on is that the tourist values freedom, specifically, the freedom to change plans and explore, because they are presumably learning new things about the place and what might interest them as they go. They also need to be able to satisfy basic functional needs without too much trouble or the experience will become unpleasant quickly. The conversational aspect is aimed squarely at the transit tourist who is looking for anecdotes about how well the system serves the people who live and work in its territory compared to some past reference point or another system or their own past experience. There is simply no substitute for asking questions and engaging in discussion with people who use the service. That’s a different level of perspective than one gets from the more general data driven explanations given by agency staff. Both have a role in developing a fuller understanding. Drivers are a great resource too. Ask your driver (without distracting them while driving) how long a particular trip used to take or how frequently this or that route used to run? Some have a lot of knowledge about past routes and frequencies and what worked well or not. In new world cities, invite a tourist to visit the city for a number of days and not hire a car or taxi/uber about. They will extremely quickly discover the difference between a useful public transport system and those typical of American and Australian cities. Enjoy your ride. In the US, how about a good old scavenger hunt, with some items in/or about the transit system itself, but most outside of it? In addition to the items, there is nothing like a little bit of impatience, a little competition, getting lost that makes you curse or appreciate transit, usually on the sly. Thinking outside your box and inside Rick Steves’ box, RS always points out the regular local transit ride that duplicates more cheaply the hop on hop off tourist ride. Seems like in most European cities that there is one of those, and it has to be a good sign if your redesign produced one. Just give people a map of the frequent network and tell them to treat it as a spontaneous mobility map where no matter if it is the weekend or late night or peak or anything, they should be able to move freely within that network. The more this is true the more a tourist can appreciate the network and view it objectively. It is difficult to travel across a whole long network of hundreds of miles, but it is not difficult to find yourself wishing the bus came more frequently at 1 pm on a Sunday, or indeed any other time of day service is drastically lower than the peak or weekday levels. – stop trying to tour the technology and tour the people instead. Find something with a large catchment area (place of worship, furniture store, bowling) and ask how people got there. Don’t know Houston fare card works but mine keeps track of hoardings including transfers. Put readers at exit doors and give a discount to those that use it. Then you have a dataset of usage patterns. Then interview various pattern users. Could work even without the exit data. Ask for volunteer smartphone users to allow tracking. I think this is part of the image problem that buses have among certain urbanists. London and Vienna are a couple of cities where I’ve spent time with friends and family who live there. Had I visited purely as a tourist, I’d have used the metro systems almost exclusively, since they’re easier to understand and go to most of the major tourist attractions. Only by traveling with people who actually live there and use public transportation daily did I find out how useful and well-liked the bus networks are. I googled “top 10 attractions in Houston” and several travel websites came up with a list. You could then see how many you could visit within a particular time period? Over the years, I have developed my very own system to explore a city and its transit system. Once a month there’s a meeting (evening on a Weekday) in a bigger city (Hamburg). Then I take advantage of the ticket which includes all busses, subways, etc., ferries(!) and get there a lot earlier. I got with me a map (paper) and its index of streets (also on paper) with a subway map at its end. At the beginning I “collected” subway stations and underlined them when I got on, got off or changed. I also marked streets in the index when I saw a street sign while walking. Over the years the papers fell apart so I had to change my “plans” and “collect” the first 26 streets of the alphabet before the western half of the subway map were completed. Which was interesting as I also got to know the periphery where busses only go once in an hour. But I’m there to explore, not to be fast. So, when the bus wouldn’t come in the next 5 minutes I walk to the next stop. However, 2 hours before the meeting I look for something to eat and access to the subway system. It always worked. I sometimes tell people that to understand a city you must circumnavigate it. And not just the city centre but the metropolitan region – ie out to about 20 or 30km. That’s easy in cities with frequent orbital routes or smaller segments that are frequent enough to easily connect between. But not in cities that only have radial routes. Tourists are also biased by their propensity to stay at inner or near inner city locations. To experience the network as a local you need to stay in middle suburbia. Ideally for this purpose it would be at the junction of two frequent routes (giving access in four directions – one being to and from the CBD the other being cross-suburban). Travel patterns also need to be non-touristy – ie not only to the city but also to the main regional shopping centres, universities and employment areas within 20km. Also at peak times (to experience crowding and the extent of bus priority) and when some might start or finish work (eg late nights or early weekend mornings). Even big cities with developed radial transport systems can have very rudimentary services to their biggest suburban job areas (notably around warehousing and airport districts). Reliability is probably the hardest for the occasional tourist to experience, since a network that fails 10% of the time would still score high marks due to the low probability of them experiencing it. Whereas it could be a deal breaker for the every day commuter relying on unreliable trains to feed infrequent feeder buses. Of course, none of this solves the problem for how to give an experiential demonstration of a network to a visiting politician. They’re probably not going to give more than 30 minutes, if that, and that isn’t enough to experience the freedom a system brings. They may also be mentally comparing it to their normal mode of travel, which is likely driving or even being driven. You can see a lot of the city on the 82 Westheimer. And now that daytime frequency has been increased to an astounding 6 minutes, you won’t be waiting long! The problem is that it’s just one bus line. The increased frequency is nice, but it doesn’t really convey the idea that the city now overall has better mobility. It depends how much time you have. In the Bay Area, if you’ve got most of a weekday, you can loop the Bay, which will take you through San Francisco, Oakland, and San Jose, as well as many other places. Depending on how much time you want to devote to this, you can take a looser (longer) or tighter loop. One line version: Go to a random number generator. Ask it for a number between 1 and 100, which most transit route numbers fall within. Ride the route generated. I just got 7, which would give me the Haight-Noriega bus in San Francisco, which would take me through the Haight and out through the Sunset district to the ocean. (If you pull a number that doesn’t exist, pull again). An Australian transit guy told us what he wanted to see when he visited Toronto. He went out to a typical arterial intersection in our suburbs. He said he watched with great interest as passengers transferred from east running buses to north running buses and the various other combinations. I believe he actually took some pictures of a steady stream of customers crossing the street to continue their journey on our largely grid based bus network. He wanted to be able to go back and tell colleagues and doubters back home that transfers did not have to take place downtown or in a fancy terminal. This is really interesting. I think this would not really qualify as touring to many people, but simply standing around and watching as other people use the frequent network is something I would have never thought of. It shows the convenience of transfers ( and also every 15 or however many minutes ), the cycle repeats. If you videotaped this, you could compare intersections with lines of different frequencies. If you sped them up at the same speed each (or didn’t), you could compare the direct effect this has in relation to a spot where infrequent lines cross. I live in Malta (in the Mediterranean), and the bus network, both in terms of routes and frequency is biased in favour of tourism. For instance, we have a winter / summer schedule, where frequencies of certain routes are reduced in summer (e.g. to the University / Hospital) and increased on others (e.g. routes to the popular beaches and attractions). What about the University / Hospital commuters? Political talk about ‘solving’ the traffic problem by constructing a metro system also primarily focuses on tourism. Our island is 246km2 with 60% – 70% people living in an area of 45km2. Our population is of 460,000 persons. Two million tourists visited in 2016. We own some 360,000 cars. The bus network is served by 500 buses. a) What is it like, as a tourist, to use the system? b) From the system owner’s perspective, how do tourists use the system? For part a), having information easily accessible is key. For instance on a recent trip to San Francisco I exclusively used transit to get about. In the modern world I wasn’t in any way interested in paper maps or diagrams of frequent transit networks, I simply pulled out my smartphone and said “I want to go here”, then let it do the rest. Virtually every time there was a bus stop / streetcar / whatever within a block or two of me that was coming in less than 10 minutes and took me where I wanted to go. Easy! From a tourist’s perspective the SF system had a super simple smartphone app for buying tickets – no messing about with cash / change, just click and go. Fare convenience is a huge thing too; not having to worry about transfers or really even know what the fare is supposed to be makes the system simple to use. For part b) the system needs a way to identify “tourist” users versus “local” users. The SF system above doesn’t really capture that at all; my “pass” on my phone had no location or tap in / tap out associated with it whatsoever. They may know that I bought tickets and I’m from out of town due to the credit card records but there will be no data whatsoever to show how I used the system. I would have just bought a Clipper card, but they were hard to find if you weren’t already at a major station. Things like “collectable” fare cards, say with photos of the city or something (other than the bland “regular” cards) that were easily obtainable from hotel front desks would have changed things significantly. If I could have just bought a card with $10 or $20 pre-loaded at the front desk (or even had it included in my hotel bill!) I would have used it for sure. Tracking the movement of those cards would be much, much easier and would give excellent data around how “outside” users use the system. When I do transit tours, as someone else mentioned I generally stay in an out-of-central city area with a prevalence of chain hotels and reasonable rates. Then try to hit the major routes and destinations that locals might go to, which may be out of the beaten path. This may be a restaurant, a park, museum, or other attraction. 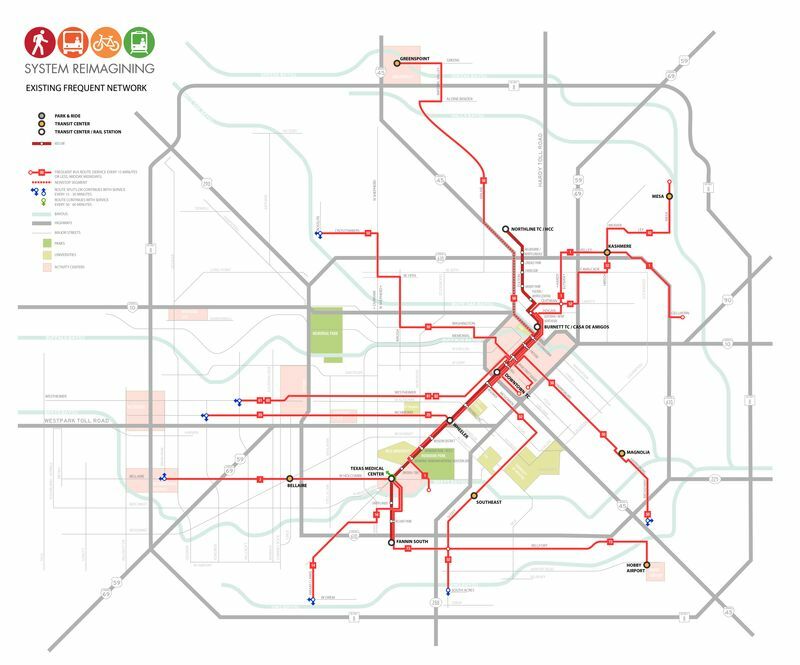 Just noticed this post a couple months late, but thought y’all would enjoy that we tried to do a little thing at the launch of the New Bus Network at Houston Tomorrow called the New Bus Network Challenge. The idea is that people would raise funds like for a fun run and then have to get to all the green spots on this map via transit. They didn’t actually get the map, so when you got to each stop, you had to ask for the clue of where to go next. But it was kind of a flop in terms of us marketing it with a tiny staff of two people. I think one guy did the whole route. Home › General › Can You Tour a Bus Network Redesign?